Hi, my name is Dee and I have been a police officer for 30 years now. I have always been blessed with lots of energy, and apart from one or two thankfully minor health matters, have not been too troubled about my own mobility and mental health. I have sadly had a lot of experience caring for friends and family matters which is perhaps why back in April 2009 I was able to cope with something of a shock. I like many of us, have always been encouraged not to shy away from being physically health conscious and to regularly check myself for any potential lumps and bumps. As something of a fitness fanatic at the time, this was an important part of my regime, in truth so I didn’t pick up any injuries or anything that might prevent me from being able to participate in sport. So on one morning in April 2009 I was very shocked to find an unexplained very hard lump just below the tissue in my left breast and sitting next to my rib cage. Rather than ignore it or think it wasn’t anything to worry about, I picked up the phone and rang through to my doctor’s surgery and asked for an appointment. I was asked to go in straight away and my GP examined me and said “I don’t think it is a cyst and I am going to refer you immediately to the breast clinic at the local hospital.” I guess I already knew at this point that it was something serious. I had a two-week wait and then attended the clinic feeling somewhat anxious as I didn’t know what to expect. The staff were lovely, reassuring and caring, and all helped by the great WI tea point in the clinic itself and several mugs of tea!! However (given I’m a cop and have a nose for concerns), I realised that the dark shadow I could see on the ultrasound scan, and the difficulty the consultant had to take tissue for a biopsy may not prove to be good news. Two weeks later I was back awaiting my results (and took a very dear friend with me), and as I walked into the consultation room and saw three people waiting for me, I instantly knew that it was as I feared – I was told I had cancer. Every patient (or family or friend) will hear and deal with this news differently. As I looked around the room I was determined not to give the staff any upset (after all they have to give this news to sadly far too many people every day). So there and then I decided I would deal with cancer head on, try to see the positives, and for once in my life to do as I was told!! Two weeks later I had the lump removed which on assessment was a Stage 1 cancer and thankfully relatively small. I was advised I would only need radiotherapy some four months later, but that it would be daily for five weeks, and that I would be required to take tamoxifen for five years (ghastly but necessary). I was fortunate not to need chemotherapy, and feel for all those who sadly do. A cancer diagnosis means you are instantly covered by the disability legislation and all the protections that this affords. I also ensured that I didn’t do what many do which is surf the internet looking for information. I was given some great advice against doing this (and risk scaring myself completely), rather I used the Cancer Research UK site which is excellent. Telling my family, friends and colleagues wasn’t easy, especially given there is no history of cancer in my family and that up to this point I had been so healthy and active. Learning to slow down, and accept help was tricky for me. Over time I gradually went through my treatment plan, determined to be positive, and to gently improve my health again. I found the radiotherapy exhausting. I stayed at work though (every morning in the office, every afternoon at hospital, sharing the sisterhood which developed with fellow patients – they were all women in my cohort but of course men can also suffer from breast cancer too). I would sit and share thoughts knowing that some of these amazing women might not get through their treatment plan and found this very humbling and moving. Without a doubt it has made me stronger and more determined as a Chief to proactively promote the importance of wellbeing and caring for one another. 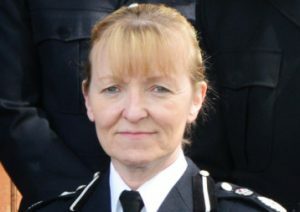 The support I had from my Force at the time was absolutely outstanding, particularly given I was an Assistant Chief at the time and I was determined to do my job (even though I couldn’t really do all of it at the time). Staying at work was important for me and I was lucky to be physically able to do it. I fully appreciate that this is often not the case for some of our colleagues who need our support whilst away from work. It took me a very long time to get back to a degree of being fit and well again. I am not the woman that I was though. The tamoxifen experience was dreadful and I won’t elaborate on that suffice to say my consultant signed me off from needing it after just over two years. I also have some problems from time to time with my left arm following the removal of some lymph nodes, and I also had a follow up procedure to minimise the risk of cancer of the womb. It has made me even more resilient, very appreciative of others, and every morning I wake up grateful that I am here to carry on living a (now) cancer-free life helping others. I have no doubt that keeping a positive mindset certainly helped me, and also that I had been so fit and active before, meant that my recovery time was better than it might have been. I did seek counselling as part of my treatment, and I have to say this significantly helped me deal with my emotions and the anxiety of ‘cancer returning’. I was aware that I needed to care for both my physical and mental wellbeing. I also haven’t been afraid of seeking help and the power of sharing can be very beneficial. Although it is now eight years since my diagnosis, I live with the ghost of cancer every day, and am constantly smiling that I learned so much from the experience, and that I am still here today (and leading our incredible West Yorkshire Police). I hope that by sharing some of my story, it helps to support someone else – even if in a small way.